In more than 30 published clinical studies, researchers tell us what Juice Plus+ does inside our bodies. One of the newest of these studies shows what Juice Plus+ can do to improve how we look on the outside, too. In the first skin research conducted on Juice Plus+, experts at the skin research center at the University of Witten/Herdecke in Germany monitored several indicators of skin health in 52 women over a 12-week period. 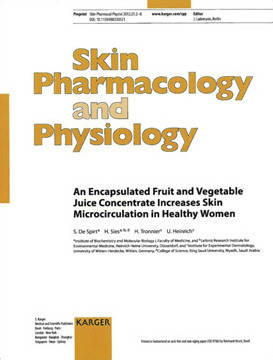 This study was published in the Journal of Skin Pharmacology and Physiology. Dr. Ray, a longtime proponent of Juice Plus+, has seen the positive impact of taking Juice Plus+ on people’s skin – including her own. “Now we’re about to have our first clinical data to help support this observation,” she shares appreciatively. Please watch Dr. Ray's video below. The Witten/Herdecke skin research team has completed their study and analyzed the results. The resulting scientific paper is now being prepared for peer review and publication. Please watch Dr. Ray together with 7 other doctors, in the video below.